There has rarely ever been an artist more fully in command of as many different art forms as Orson Welles during his height - the late 1930s and early 40s. He revolutionized the stage, radio and cinema before the age of 26 and became a household name in the process. Welles’s first brush with national fame came at the age of 20 when he staged an all-black production of Macbeth in Harlem. The 1936 play was groundbreaking both for its striking sets and its darling interpretation that set Shakespeare’s bloody tragic in Haiti. But perhaps the most remarkable aspect of this production was that it was done entirely with non-actors. Through sheer charisma and force of will, Welles coaxed and cajoled terrific performances out of day laborers and factory workers. Two years later, in 1938, Welles ended up on the cover of TIME Magazine for his staging of Julius Caesar. He set the play in contemporary fascist Italy. It was a bold choice that turned a 340 year-old play into a work of great political urgency. That same year, Welles also managed to freak out the nation with his brilliant, wildly irresponsible adaptation of War of the Worlds. Welles staged the beloved sci-fi novel as if it were a news report. The broadcast captured the drama and terror of an emerging calamity all too well; it caused a public panic. 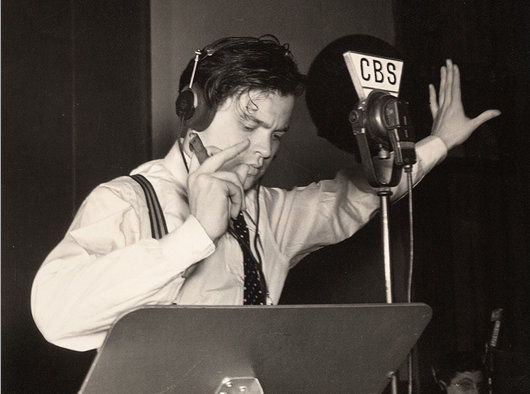 Now you can listen to that infamous radio play along with 61 hours of other radio plays, all created by Welles for his 1930s radio show, The Mercury Theatre on the Air. The Spotify playlist, embedded below, includes A Christmas Carol, Heart of Darkness and even a rehearsal for Julius Caesar. Check it out. And if you need Spotify's free software, download it here. The notoriety of Welles' radio work landed him one of the most generous movie contracts in Hollywood studio history. This is doubly impressive because, at this stage in his life, Welles had no idea how to actually make a film. The resulting movie was a barbed, thinly veiled film à clef of one of the most powerful men in America – William Randolph Hearst. This proved to be a terrible career move; Hearst’s wrath derailed Welles’s career for years but it did produce a pretty good movie – Citizen Kane. Thanks for writing this article and sharing the Welles experience. He certainly was an enigmatic and charismatic figure as well as an interesting man.